yep. you better believe it. these were quite the attention-getters today. oh. and i don't want just any goat. i think we could be great pals. I just watched a show that had fainting goats on it. Well, it was a month ago or so, and I can't remember what show...but I thought it was pretty cool. About as cool as your pink pants. haha those goats are funny! i've never heard of such goats! Be careful! what are you doing up on the spinning computer chair anyway? Love the pants! you got real fancy moves miss geri. real fancy. 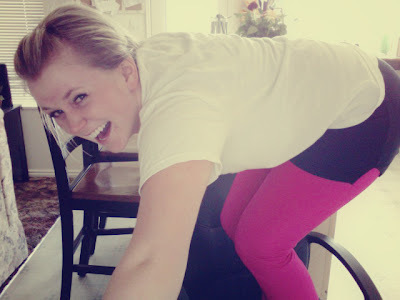 your blog is adorable (as well as your pink yoga pants!) thanks for sharing your orchid-photo blog with me...you're fantastic! also, thanks for being such a great friend. hope to see you soon! Geri... I wanna see those pants solo with no shorts on top! Come on, ya know ya wanna! and you don't wanna me too eitha!